The development of The Central Nebraska Public Power and Irrigation District created many unforeseen benefits. Originally constructed in the late 1930s and early 1940s to bring irrigation to a parched area of south-central Nebraska — while generating hydroelectric power — the recreational benefits of the project’s reservoirs, canals, and canyon lakes soon became apparent. By impounding the unpredictable flows of the North Platte River in Lake McConaughy and diverting some of the river’s flow into a supply canal that created other reservoirs, the project laid the groundwork for the development of varied water-related outdoor recreation unique in the central Great Plains. Lake McConaughy is one of Nebraska’s most popular recreational attractions according to the Nebraska Division of Travel and Tourism. 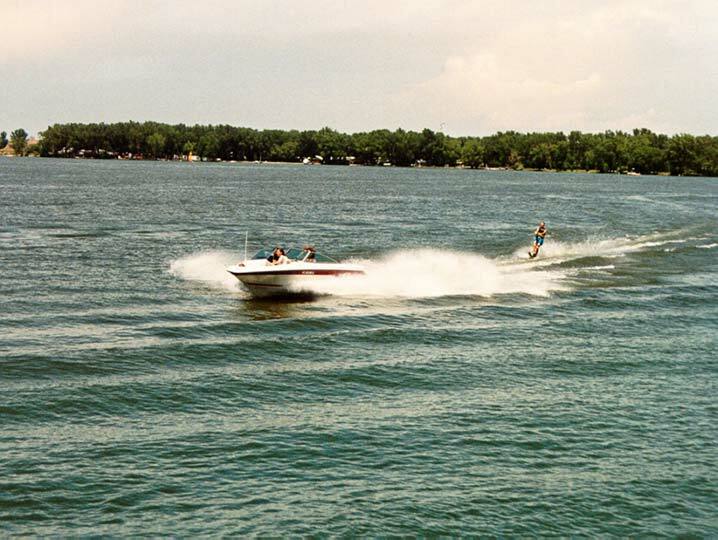 The lake and the surrounding land are used for a wide variety of recreational pursuits, some unique in Nebraska. This variety of attractions helps explain why a lake located in a sparsely populated state and more than 200 miles from any major metropolitan area is so popular with visitors. The north shore of Lake McConaughy is known for its fine, sandy beaches. 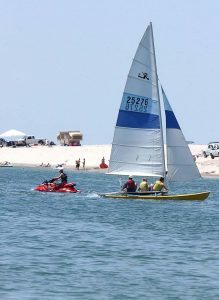 Several bays and coves — some with modern camping facilities — offer excellent recreational opportunities for boating, picnicking, jet skiing, swimming, wind surfing and water skiing. 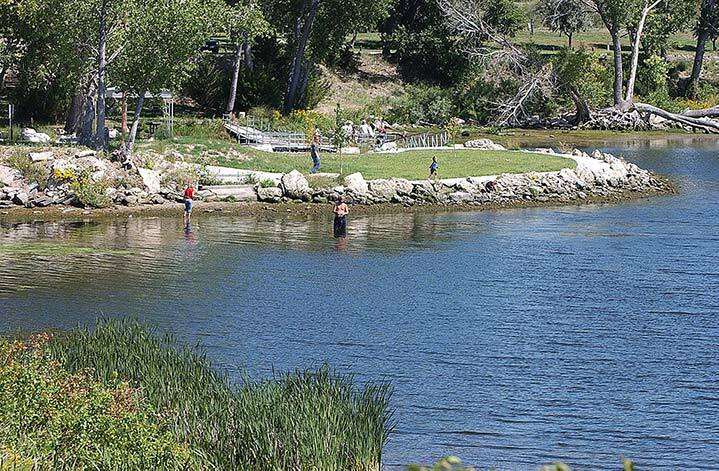 While the south side of the lake is generally not as accessible or developed as the north side, excellent recreational opportunities present themselves on the lake’s southern shores as well. Almost all Central property surrounding Lake McConaughy is leased to the Nebraska Game and Parks Commission (NGPC) at no cost to be used for recreational or wildlife purposes. An NGPC park entry permit is required for vehicles entering the State Recreation Area. A small amount of land is retained by Central for operations, District houses, etc. Some of this land is subleased by NGPC to a number of private concessionaires who operate recreation-related businesses around the lake. Central annually leases the land within the Clear Creek Wildlife Management Area (6,244 acres at the west end of the lake) to NGPC for $1 an acre. The WMA is visited by thousands of waterfowl, shorebirds and sandhill cranes and is home to a variety of game animals. Hunters seek white-tailed and mule deer, wild turkey, ducks, geese, pheasant, quail, grouse, rabbits and squirrels within the WMA’s boundaries. Lake McConaughy has gained a reputation as an excellent spot for nature lovers and bird watchers. More than 300 different species of birds have been spotted on and around the lake. The birds are attracted by a diverse habitats that appeal to many varied species. The entire shoreline at Lake McConaughy is open to the public for camping and other recreational activities, except for areas that may be fenced off during the nesting season for least terns and piping plovers. Private housing developments and a golf course (Bayside) have been constructed on the south side of the lake and four areas contain housing and/or summer cabin developments. Modern campgrounds are located at Little Thunder Bay, Lone Eagle Bay, and Cedar Vue. There are more than a dozen boat ramps at Lake McConaughy, most of which can be accessed without a fee. Three ramps have been extended to serve as low-water ramps as a result of recent low lake elevations caused by drought. 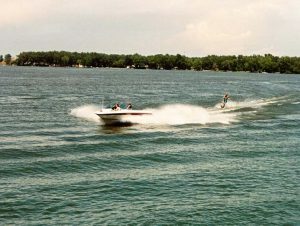 The low-water ramps include Martin Bay swimming beach on the northeast side of the lake, Divers Bay on the southeast side. The NGPC, in cooperation with private donors, opened a new Visitor Center at the lake in 2002. As of 2003, a Water Interpretive Center that tells the story of water in the Platte River Basin was under construction. Lake Ogallala lies below Kingsley Dam. Created when sand was pumped from the river bed to form the downstream side of Kingsley Dam, the lake has approximately four miles of shoreline. The lake’s water remains cold even during the summer because it is drawn through Kingsley Dam from the bottom of Lake McConaughy. The cold water is not suitable for water sports, but makes it appealing to trout and other species of fish that prefer cold water. The NGPC operates a modern campground on the east side of the lake and a primitive campground on the west side of the lake. During the winter months, Central’s eagle-viewing facility, located on the south end of the lake below the Kingsley Hydroplant is open to the public (see Eagles for times and dates). Water released by Central from Lake McConaughy for irrigation and/or power generation is either diverted into the Nebraska Public Power District’s supply canal or passes through Keystone Dam and flows about 50 miles down the North Platte River to Central’s diversion dam. Water from NPPD’s supply canal returns to the Platte River just above Central’s diversion dam. The diversion dam, located just below the confluence of the North and South Platte Rivers, diverts water into Central’s Supply Canal, which runs for 75.5 miles on the south side of the Platte River Valley. Along the way, the Supply Canal forms 26 small lakes along the way that are suitable for recreational purposes. The public is permitted to use the entire length of the canal for recreational purposes, excluding areas around Central’s three hydroelectric plants and NPPD’s Canaday Steam Plant. Much of the canal is paralleled by maintenance roads or state and county roads. The canal, which carries water year-round, and the canyon lakes are used for hunting, hiking, canoeing, camping and fishing. Only wakeless boating is allowed on the canal to prevent bank erosion. Fishing and hunting are the two most popular recreational pursuits along the canal. Channel catfish are the most common fish taken from the canal, although fishermen also hook white bass, walleye and flathead catfish. The small lakes along the canal were formed when engineers found it better to dam the mouths of many of the canyons along the canal’s route rather than build flumes or siphons to transport the water over or under them. The lakes range in size to less than 1 acre to more than 500 acres and are mostly undeveloped because of their remote location and steep banks that sometimes makes access to the water difficult. In addition to recreational opportunities, the lakes provide habitat for a variety of native and migratory fish and wildlife. Some of the larger lakes like Jeffrey (south of Brady, Neb. ), Midway (south of Cozad, Neb. ), Gallagher Canyon (southeast of Cozad) and Plum Creek Canyon have developments such as boat ramps, primitive campgrounds, picnic facilities and private cabins. A State Recreation Area at Gallagher Canyon provides facilities for primitive camping. Gallagher Canyon is designated as a wakeless boating lake. Johnson Lake, although not a canyon lake, is the largest on Central’s supply canal. A regulating reservoir for the Johnson No. 1 and Johnson No. 2 hydroplants downstream, Johnson Lake is highly developed for recreational activities. Homes and cabins line the shorelines and the NGPC maintains two campgrounds with electrical hookups, boat ramps, restrooms and showers. A swimming beach is also available to the public. The NGPC charges a daily camping fee and a park entry permit is required at the SRA. Created in the late 1970s as part of a project to rehabilitate and improve the E65 Canal system, the Elwood Reservoir was formed by damming one end of a series of canyons and pumping water into the resulting reservoir from the E65 Canal. At maximum pool, the lake contains almost 25,000 acre-feet of water and covers more than 1,300 acres. The amount of water in the reservoir decreases each summer as the irrigation season progresses, but the lake is refilled annually. Located just three miles south of Johnson Lake, Elwood Reservoir is stocked with game fish by the NGPC and has developed a reputation as a top walleye fishery. Hunters (waterfowl and deer) may use the 579-acre Wildlife Management Area, but camping on project land is not allowed. Since its inception, The Central Nebraska Public Power and Irrigation District has made a continuous and concerted effort to provide high-quality recreational opportunities at its facilities. Through cooperation with the NGPC as well as private developers, the combined facilities provide Nebraskans and out-of-state visitors alike with an abundance of recreational opportunities. There are almost 6,000 acres of land adjacent to District waters that are designated State Recreation Areas. Another 6,800 acres have been set aside as Wildlife Management Areas. The main attraction, of course, is the total of 35,688 surface acres of water which comprise Central’s many lakes and reservoirs. From one end of the project to the other, there are more than 20 campgrounds, and 11 areas for recreational vehicles with space for more than 450 RV pads, nine trailer parks and innumerable sites suitable for primitive camping. 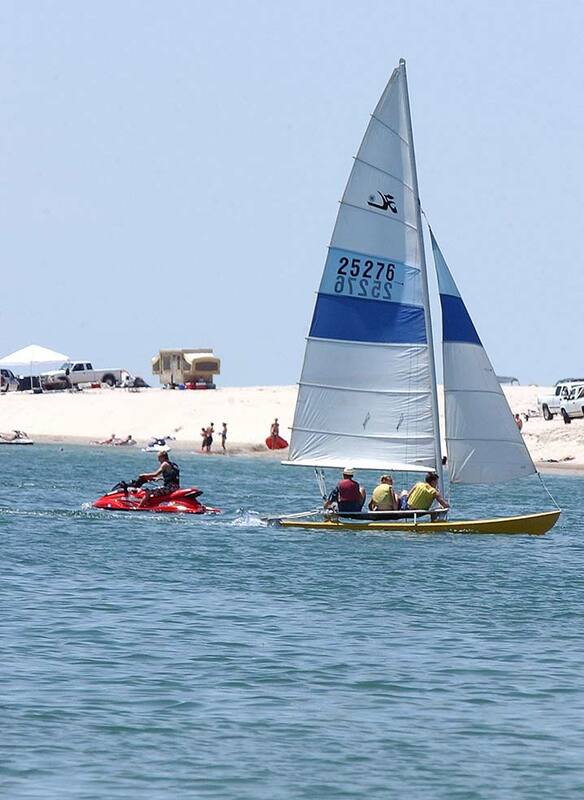 Recreation areas are equipped with picnic tables, grills, water wells and boat ramps. Central has made these facilities available to the public in an area that, for the most part, would be devoid of water-based recreation were it not for the existence of the project. Central’s project has created an aquatic and terrestrial biological diversity not previously found in the region. The diversity provides for unique fishing, hunting, wildlife observation and photography opportunities. The quantity and quality of the recreational resources has had a significant impact on the economy of the region, especially in the Ogallala and Lexington areas. These resources keep a significant amount of tourism dollars in the state that would otherwise bypass or be taken out of the state. To briefly summarize, the quality of life in Nebraska is enhanced immeasurably not only by the contributions Central makes to agriculture and power generation, but by the presence of these recreational assets. Is hunting allowed along the E65 canal? Hi Zach, Our biologist Dave Zorn will be getting in touch with you regarding Central’s hunting policies. Thanks!